I have to admit it can be challenging to prepare some of the Indonesian dishes because of the different uncommon spices and herbs being used. Take “kencur” for example. Kencur is a very common spice used in Indonesia, especially among the Javanese and Balinese. However, it is not easy to find kencur here in the U.S. It doesn’t even have a “proper” English name. Some people call it aromatic ginger, some call it sand ginger or even mistakenly translate it into galangal (lengkuas). This root spice kinda look like both ginger and galangal. So, if you can’t find kencur, the best you can do is to substitute with both half ginger and half galangal. I find it a bit saddening too that Indonesian culinary is not very well-known in this part of the world. I can’t find a single Indonesian restaurant here where I live (sadly!). Majority of Americans I know enjoy Thai food, Indian food, Japanese food, Korean food, African food, etc..etc. But majority have no clue about Indonesian food (unless a small bunch that are very well-travelled). I’m not really sure why. I hope with the ease of access to Internet these days and with more open-minded, Indonesian culinary will gain more popularity. 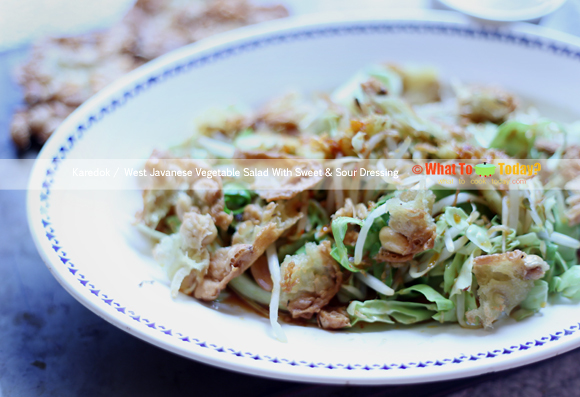 Most of the Indonesian-Chinese vegetables are usually being stir-fried and rarely being eaten raw. 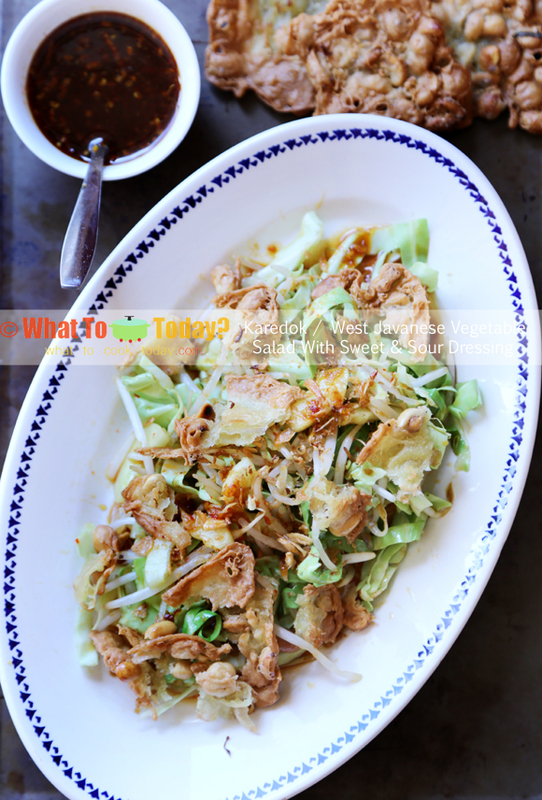 However you will find mixture of both cooked and raw vegetable dishes in the native local culinary. 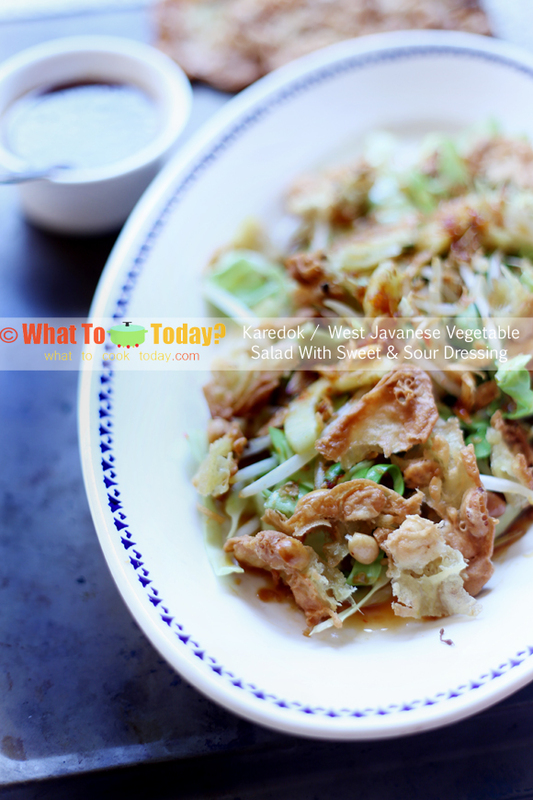 Karedok is one of the examples of raw vegetable salad eaten in West Java. 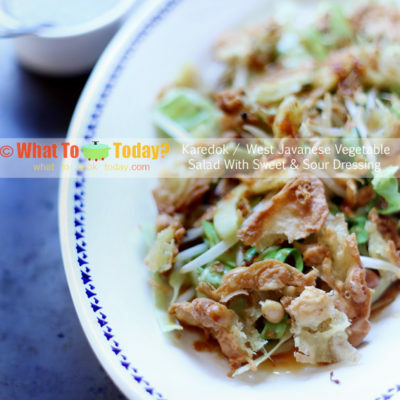 I love the crunch and the freshness from vegetables and dressing is typically made with varieties of aromatic spices and herbs. I actually serve this karedok with rempeyek kacang and it was delicious. Not traditionally being served that way, but hey it’s yummy!